This time, a $140 donation which makes $280 so far, and surpasses her new goal of $250 set last week. Drouillard made the announcement via Periscope and Twitter this morning. Nicole reported in her Periscope broadcast that since Knitnscribble's original posting, Knitty Blog and even Vogue Knitting have picked up the news of her #Flintwatercrisis fund-raising campaign. Tweeting as @mercantile519, Drouillard sells the water drop pattern on Ravelry for $2.50. 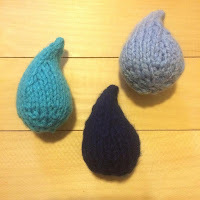 The finished water drops for Flint can be used as cat toys, decorations, etc. and are available for $7.50 in her Etsy store.